Harvard Law School dedicated the Milstein Conference Center, a central feature of the Wasserstein Hall-Caspersen Student Center-Clinical Wing building that is meant to bring students and faculty together and improve the student experience. The Milstein Conference Center consists of two multipurpose rooms, totaling 8,500 square feet, and an adjacent landscaped courtyard. Students can use the courtyard, which is provided with tables, to review their work or enjoy a meal outdoors. “The new center will facilitate gatherings and become a true focal point for the Harvard Law School community and the broader Harvard community, bringing together students, faculty, and guests in an inspiring and beautiful space,” said Harvard Law School alumnus Howard P. Milstein, donor for the Milstein Conference Center with his wife, Abby, who is a Harvard Law School alumna. Both Howard and Abby Milstein took part in the dedication. The Wasserstein Hall complex was designed by the architectural firm Robert A.M. Stern and Associates, and received LEED Gold certification from the U.S. Green Building Council. Along with the Milstein Conference Center, the building contains classrooms, a lounge, offices for student organizations, journals, and clinical programs, and an underground garage. 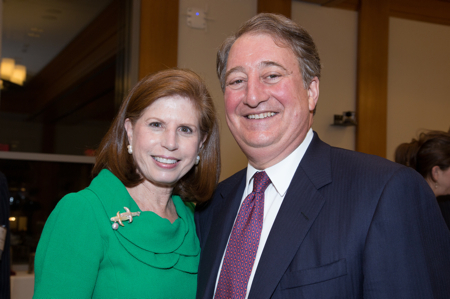 Abby and Howard Milstein, both of whom are Harvard Law School alumni, at the dedication of the Milstein Conference Center at Harvard Law School. 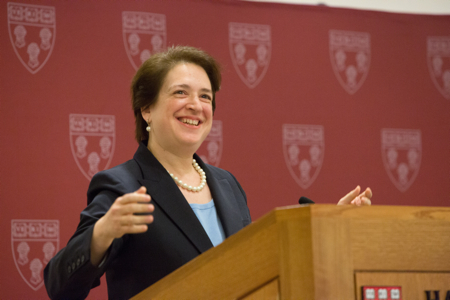 Associate Supreme Court Justice Elena Kagan speaking at the dedication of the Milstein Center at Harvard Law School. For additional information about the new Harvard Law School complex and a link to an interview with Howard and Abby Milstein, click here. 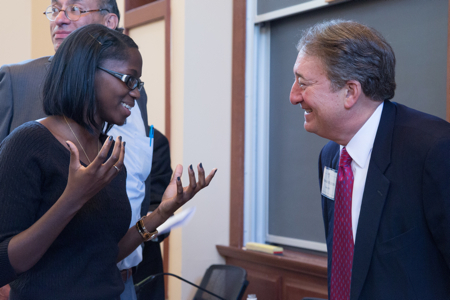 Howard Milstein talks with an attendee before the dedication of the Milstein Conference Center at Harvard Law School.